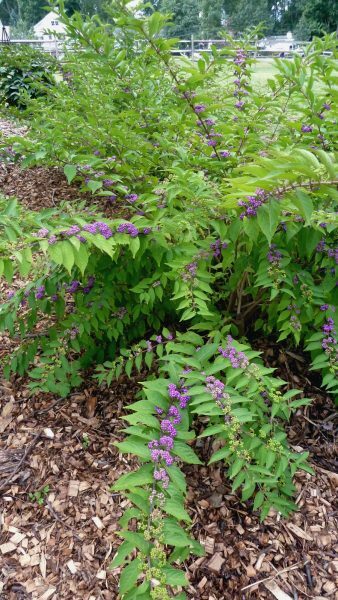 Home Q & A What is the bush with bright purple berries blooming at the Community Center? Q: I was over at the Rowayton Library and noticed a shrub with bright purple berries clustered on its drooping branches. It’s such an unusual color amid the fall leaves – could you tell me what it is? A: There is no question…this is Callicarpa, a wonderful bit of color in the fall border. Also known as Beautyberry, it blooms at this time of year and can make a terrific addition to your holiday centerpiece when cut. Look for the native Americana species, as there are others such as Japonica. Double check the nursery tags to make sure of the species you’ve selected. Full details are available on the USDA Plat Profile Fact Sheet.